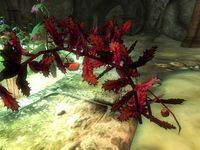 Chokeberries can be harvested from the Chokeberry Vines in the Garden of Venomgrowth of Deepscorn Hollow. Chokeberries are listed under ingredients but, similar to poisoned apples, they cannot be used to make poisons. Instead, they are used to directly poison anyone who eats them, including the player. Chokeberries can be combined with other script effect ingredients, although the resulting potions are not generally useful. Unlike poisoned apples, they are not zero-weight, preventing them from being reverse-pickpocketed onto a target; they must be left out for a target to consume, and NPCs other than the target can also consume them. If you've managed to eat a chokeberry and want to remove the "Poison Fruit" effect, you can use the following Console command to reverse it: player.removespell xx009BFF. Chokeberries cannot be duplicated in the Enchanted Chest in the Arch-Mage's Quarters. Esta página foi modificada pela última vez à(s) 18h09min de 24 de setembro de 2014.